Clients ask me frequently, John, if I go into a transaction with a shipper for a "lower" rate, is this a good strategy in order to get my foot in the door? First, how would anyone really know if they are going in at a lower rate? Maybe it means that if a Shipper wants to pay $1.60 per mile, you might think you are getting your foot in the door if you agree to get a truck for $1.40 per mile. This is not the way to do it, in my humble opinion. Here is the thing - if you go in with a "lower" rate some shippers will expect you to stay at the lower rate; others may bump the rates higher if they can and if you perform real well. If you are dealing with a new shipper, you don't know which kind they are. So, time and experience will tell. In our training, you will find several strategies for dealing with shippers and rates. Time and experience will be your best teacher - but you have to at least have some of the basics in mind before you go out into the real world. You don't want to come across as being ignorant when it comes to negotiations. Don't forget to "Like it". Some people ask me if they can broker freight in the evenings. They usually want to hold on to their day job. While this is not impossible, it is highly unlikely a broker can succeed if he or she is new and plan on doing this part time in the evenings. Brokering is normally an early morning and day time effort. Sometimes it may run into the evening but only after you have found a truck or trucks. Sometimes they go ahead and take the leap (quit their day time job) and other times they put everything on hold. If you are a new broker just getting started, you might be intimidated at the thought of finding a shipper that needs 20-30 trucks every week. It's probably not that much different than getting several loads per week from a shipper IF you have your systems down pat. You have to know what you are doing and it is not rocket science. It's more of a "business management" effort. Your search for trucks should include getting companies that may have a good-sized fleet. Then, when you get a shipper seeking a lot of trucks, it's just a matter of doing what you would do with one truck and duplicating it for the rest. Freight brokering is competitive. Any worthwhile business attracts competition. How will this affect you? You will be calling on customers to get loads. Your customers won't advertise this, but they will be using any number of brokers to find trucks. It's the only smart way to work if you are a shipper. Remember this - after you have worked with a shipper for some time and have proven yourself to be a "go-getter", you will get a call from your customer. He/she is calling you with some load information. He/she wants a truck. Before or after they give you the details, the shipper will say something like, "This is YOUR load". This means they are giving YOU the load and only you. And you can believe it more likely than not. This is exciting! They have learned to trust you and they want to give YOU their business - at least for that one particular load and, perhaps, for all or most of their loads. In our training, we will cover a lot of information and some of the most important info is to learn what to expect as you work your way to success. Here is a breakdown of what you can expect when getting started. The cost for the MC#, the BOC-3 permit and the UCR will run about $405. The cost for the surety bond or trust fund depends upon which vendor you select and the type of program. In general, expect to pay either $3,500 up front for the whole year or $995 every three months for the bond or fund. The cheapest way is not necessarily the best. For example, your bond or fund provider should have experience in protecting against frivilous claims. Of course, your bond or fund could be invaded if you fail to pay any trucks. This, in fact, is the purpose of having funds set aside in the first place. Nevertheless, a good bond or fund provider knows transportation law and will throw out a frivilous claim quicker than you can say flap jack. So, you are looking at about $1,400 to get started for your broker authority. Again, don't jump at the low price. In the next post, I will show you how to get started for about $1,400 if you choose to make quarterly payments on the bond or fund. I will also talk about your cushion of money needed to pay trucks on time and what you can do if you don't have a cushion of money. Is Trucking the Same as Freight Brokering? The answer to the above question is, NO. Trucking and brokering are related and complementary but they are different in profound ways. 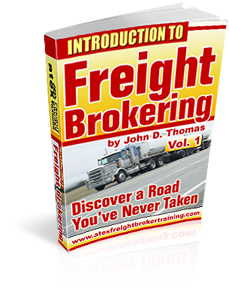 Some trucking companies have branched out and are including freight broker training as a side-service. This is okay to some extent, but they place a heavy emphasis on trucking and forget about the important issues that pertain to freight brokers. This may be misleading in perhaps several ways despite all their efforts to portray freight brokers. If you want to get a good dose of how freight brokers work and how they relate to the trucking industry, go here: http://www.atexfreightbrokertraining.com .You will find a BUSINESS approach to this industry. In addition to the website information, there are a lot of other materials, some free, some low-cost. Explore this brokering opportunity with all the effort you can muster because it is not as easy as it might appear. There are so many "do's and don'ts" in freight brokering they will make your head spin. I have a good one here that will set the tone as you begin your brokerage - that is, if you don't do it. Here is the scenario: after you have worked to find one or several shippers whom you have spoken with and they now want you to send your set-up package, you DON'T want to sit waiting for them to call after sending your package. No, never! Wait 2-3 and get on the phone. Make sure they have received your package. If you are not as aggressive as a nice pit bull, you ain't going to go nowhere in this business. It's tough starting out. You first may spend a lot of time and effort getting your initial few loads. Then, what happens? You have to then come up with a truck - or maybe a few. Can you find trucks when you want them, where you want them and on terms that are suitable to both of you? This is going to be the real challenge for the foreseeable future. There are a number of resources that you can use to find information about new carriers. You will pay for this service. And some of the info may be free from the FMCSA website. But you should have in place your performance metrics to use in evaluating your carriers once they start working with you. You really don't want to go out there and just grab any truck and "hope" things work out for current and future loads. Shippers may also add their two cents by becoming more strict on carrier selection. CSA qualified carriers who purchase and maintain good equipment, fine-tune and motivate their manpower and operations can expect to see higher rates. Those carriers who fail to do so will lose out. And you, as a freight broker, need to sift through all of this as you are the middle man between your customer and motor carrier. In our training, we help you do exactly this, plus more.